There's a wooden table, rustically rough-hewn. Atop, a vase of flowers, a simple breakfast – two boiled eggs, a glass of black tea – and a matchbox. Besides, a russet dog sits placidly. This is Kuzma Petrov-Vodkin's Morning Still-Life (1918), and for a piece of art created in the aftermath of the October Revolution it is eerily calm and contended. The perspective may be out of joint – we are looking in from the side as if a sitter, rather than straight away at the arrangement – but there is none of the clamour nor the dramatics usually associated with revolutionary art. This could have come from the late Tsarist days. 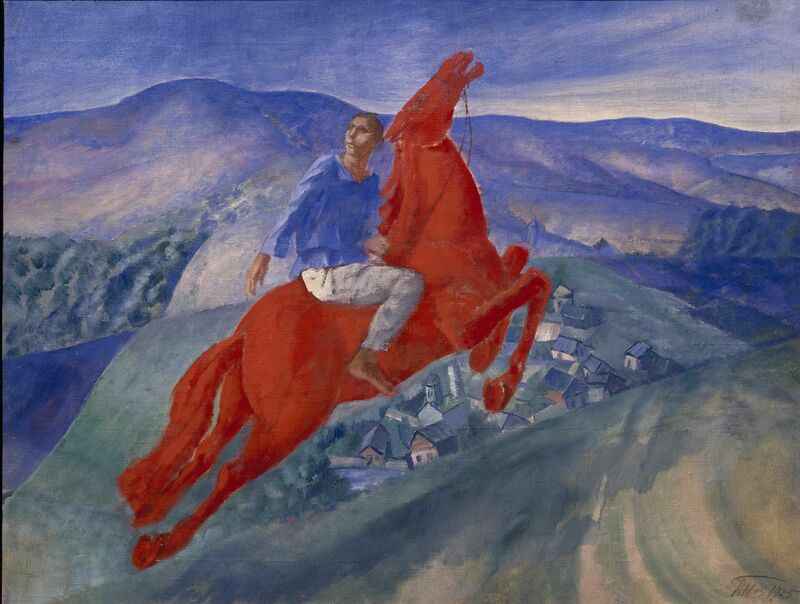 Petrov-Vodkin, whose work hangs in an entire room of the Royal Academy's new exhibition Revolution: Russian Art 1917-1932, is a curious radical. Originally an icon painter for the orthodox church, his proclivities pointed towards the Italian Renaissance. His masterpiece of 1920, 1918 in Petrograd, places a Madonna and Child on an empty Petersburg balcony. She is hard, careworn, determined; he turns away from the world and towards her. The figures scattered around them are similarly straightened. 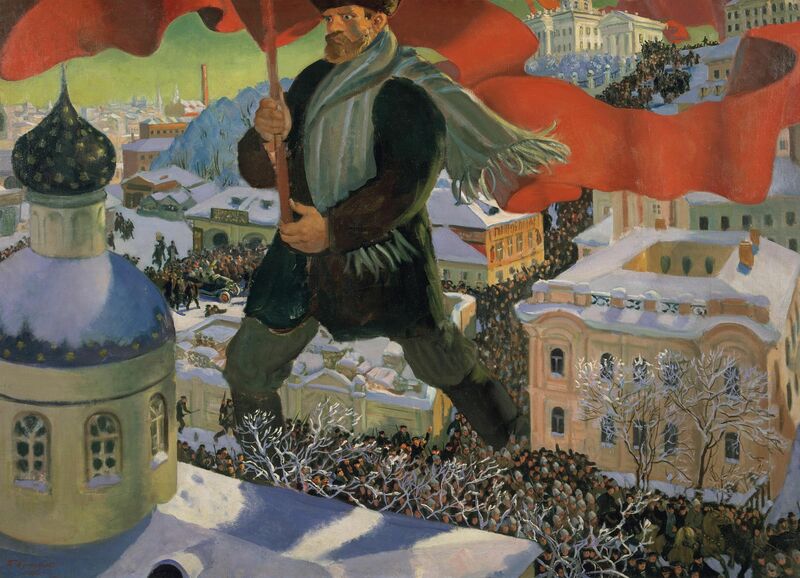 Petersburg, a stronghold of the White Army, is bracing itself for the upcoming siege: by the time Petrov-Vodkin painted this image, the former capital's population had plunged from 2m to 722,000. This is one of the most seemingly innocuous pieces in Revolution, and yet it is itself charged with moment. With some exceptions – Kandinsky's iridescent Blue Curve (1917), for instance, or the delirious aerial cityscape of Pavel Filonov's Formula of Spring – this is an exhibition which puts the familiar Russian avant-garde aside in favour of the more conventional figurative painting of the period, more socialist realism than suprematism. El Lissitzky is represented not by paintings or posters, but through a photomontage self-portrait and a model of his projected flats for Moscow's Narkomfin building. Malevich has a room to himself, a near-facsimile recreation of his display in a 1932 exhibition. Suprematist abstractions, faceless serfs, cubist canvases, architectural sculptures, ceramic plates - all find a place here, set beneath his Red (1915) and Black (1915; this version 1932) Squares. Here you can see his seemingly disparate career drawn together at once, and in a form planned by the artist himself. It's an exhilarating display. 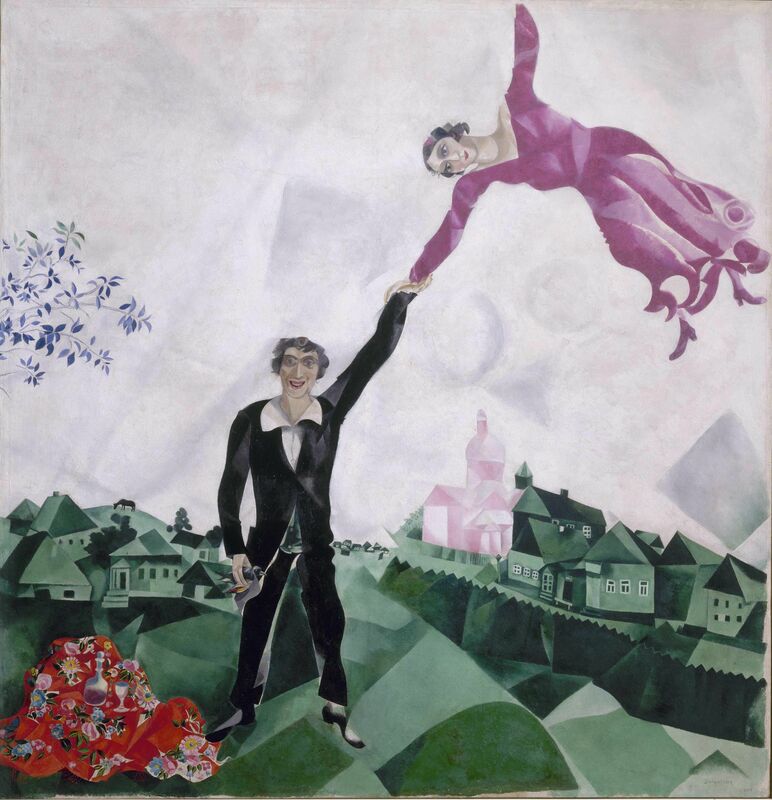 Excepting the aforementioned and Marc Chagall, whose blissful Promenade (1917-8) achieves a dream-like poeticism without the recourse to fantasy common in his later works, none of the featured painters are artists of the first-rank. Petrov-Vodkin's classicism is subtle and elegant, but there is a degree of flatness to both his brushstrokes and his imagination. There are others who manage to elevate themselves above the Soviet kitsch. 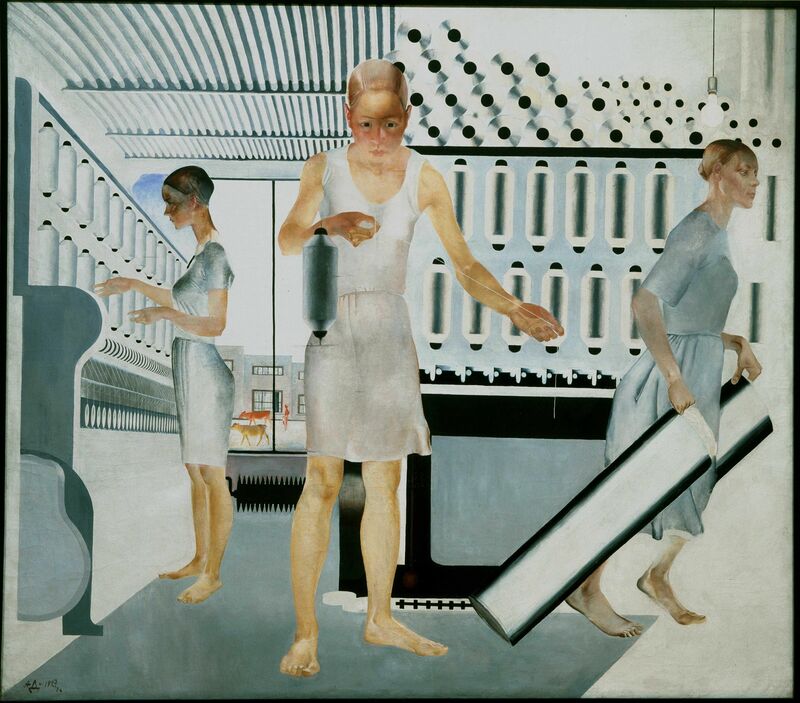 Alexander Deineka's Textile Workers (1927), for instance, would be disposable propaganda were it for the delicacy of his faces and the surrealistic quality of its background. Konstantin Yuon's New Planet (1921) casts the revolution as a sort of sci-fi apocalypse. Its figures may be calling to a red planet for deliverance, but it seems unlikely it is going to offer the easy utopia they aim for. As to the kitsch, take your pick. There are abundant representations of Lenin and Stalin as biblical forefathers, boldly shoving the nation into the future. Boris Mikailovich's Bolshevik (1920) shows a humongous comrade solemnly process over the hordes of the human insects below, while Kliment Redko's Uprising (1925) looks like a nightmarish mid-90s videogame character selection screen, with an oversized Lenin at the centre commanding his human-sized underlings. A final room, dealing with the socialist realism prescribed by Stalin from 1932 to his death, is full of clean-cut athletes and smiling peasants, a sinister corrective after Malevich's dehumanised figures. The Royal Academy, and curators Ann Dumas, John Miller and Natalia Murray, should be praised by cramming a major exhibition with such aesthetically abhorrent paintings. 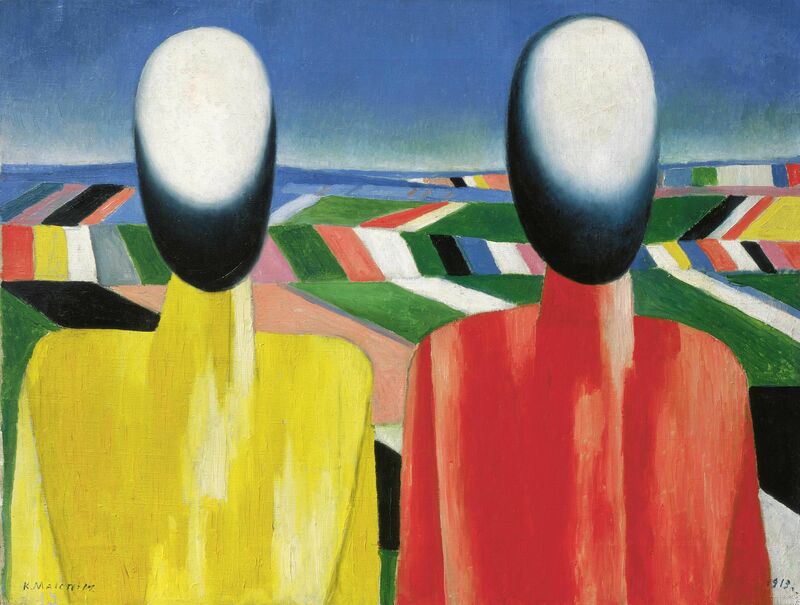 To strip early Soviet art to the modernists impose a Western narrative on Russian art. The show's determination to provide a broader picture extends to medium. The flattened world of graphic arts often provides a more attractive vehicle for propaganda than warts-and-all figuration, as a fantastically varied display of Soviet advertisements and posters indicates. There are several well-chosen walls of photography, the most compelling being a set by Alexander Rodchenko and others depicting factory labour. There are architectural models of buildings both built (Lenin's Mausoleum) and unbuilt (The Palace of the Soviets), clips from judiciously chosen films (Dziga Vertov's Man With A Movie Camera among them) and Vladmir Tatlin's Letatlin, a Da Vinci-like flying machine now cursed to spin around the Royal Academy's Dome. 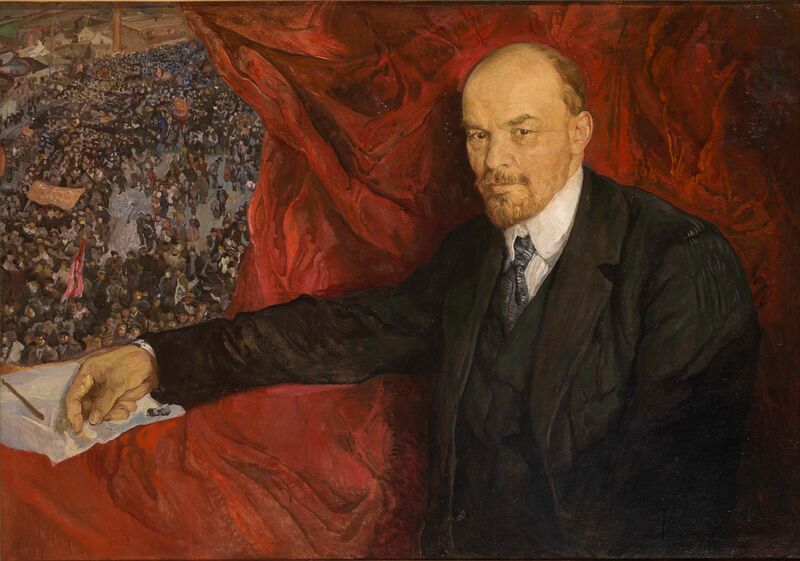 There is a danger that an exhibition like Revolution could become celebratory of the Soviet Union. Here, however, the history-focused approach makes the deprivations clear, while also highlighting the complexities of the Russian situation. Nevertheless, a final exhibit, entitled Room of Memory, shows photography of people who were disappeared or imprisoned under Stalin's Purges. Coming after the gaudiness of the previous galleries, it feels like a return to bare, sober reality.